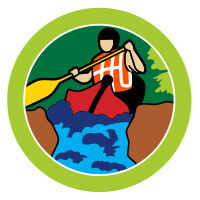 Whitewater kayaking on the Wolf River is offered to all Venturing Crew and Scouts BSA members. Leaders and parents are always welcome to participate as well. Participants are taught the techniques and safety of kayaking on a whitewater river plus the opportunity to use the camp’s COPE and climbing tower facilities. In addition the weekend includes time for movies, campfires and getting to meet new friends. Canoe and Sea Kayaking is also available May 17-19 & May 31- June 2, Sept 27-29. You and your friends can pick your adventure on these weekends, whitewater, flat water canoeing or sea kayaking. For youth and adults who would like to try Canoeing on the Peshtigo River or Sea Kayaking on Green Bay. A fully trained and enthusiastic volunteer staff provides all of the leadership, instruction and supervision for each weekend. The Bay-Lakes Council provides all equipment, food, sleeping quarters (Wausau Homes Adventure Lodge) and emergency services. Be ready to get wet. BSA swimmer classification and a completed Medical form are required. Each camper is also responsible for all of his or her personal clothing, bedding and hygiene needs.